In 2016, the topmost players participating in the global market for caps and closures for non-carbonated beverages held approximately 55% of the overall market in terms of value, states Transparency Market Research (TMR). These are AptarGroup, Inc., Silgan Plastic Closure Solutions, Bericap GmbH, and Co KG, and Closure Systems International, Inc. These companies have been installing an increasing number of manufacturing plants across the region and investing in research and development for amplifying their respective revenues. As several new non-carbonated drinks are frequently making their way into the market, the demand for caps and closures for non-carbonated beverages is slated to fire up to a great extent. For instance, Monster Beverage Corp, a major manufacturer of energy drinks, is planning to launch a non-carbonated novel beverage, Hydro, that does not fit the traditional mold. Along the same lines, San Diego-based Jack in the Box® revealed its newest signature beverage in May 2017. The new drink, Jumpin’ Jack Splash™ will be made available across 2,200 Jack in the Box restaurants. In 2016, the U.S. caps and closures market for non-carbonated beverages was pegged at US$2.64 bn. 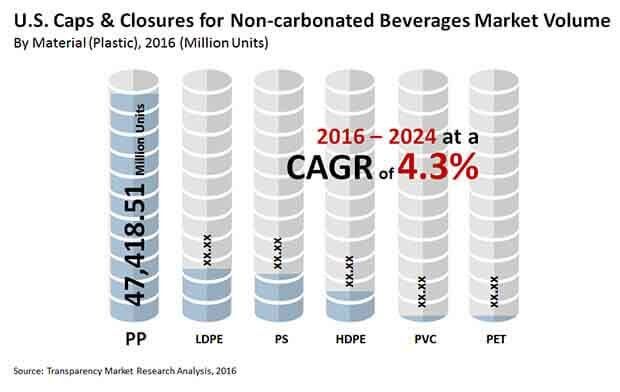 By the end of the forecast period, it is expected that the caps and closures market for non-carbonated drinks in the U.S. will attain a revenue worth US$3.82 bn, witnessing a CAGR of 4.3% between 2016 and 2024. Based on type of material, the polypropylene segmented accounted for the largest share of 60.2% in the U.S. caps and closures market for non-carbonated beverages in the U.S. Notwithstanding the growing popularity of polypropylene, the HDPE segment might emerge at the fore by the end of 2024, expanding at a CAGR of 13% during the next few years. The advancement of this segment is fuelled by the rising adoption of this material due to its easy availability and cost efficiency. By application, the caps and closures market for non-carbonated drinks in the U.S. was led by bottled water in 2016. By the end of 2024, the segment is anticipated to hold a whopping share of 69.3% of the U.S. caps and closures market for non-carbonated beverages. As the worldwide population is becoming increasing aware of the negative impact of carbonated drinks on human health, the demand for non-carbonated beverages has been escalating in the U.S. People in the U.S. are being increasingly diagnosed with obesity, further guaranteeing the expansion of the U.S. market for caps and closures for non-carbonated beverages. Smaller bottles are being manufactured by leading companies, as customers have been preferring compact packages over larger ones. The convenience of advanced packaging techniques has also been aiding market growth. The high costs of upgrading of the manufacturing machinery as well as the switching costs involved in the replacement of two piece caps by one piece ones can inhibit the expansion of the U.S. market for caps and closures for non-carbonated beverages. The market’s growth is also being restrained by the strict regulatory frameworks of agencies such as Food and Drug Administration (FDA). However, the market might recover from the negative effects of these restraints by virtue of the increasing demand for ready to drink beverages segment. The information presented in this review is based on a Transparency Market Research report, titled, “Caps & Closures Market for Non-carbonated Beverages (Cap Type - Screw Caps, Snap On Caps, and Push On Caps; Material - PP, LDPE, HDPE, PS, PVC, and PET; Application - Bottled Water, Fruit Beverages, Ready to Drink Tea and Coffee, Sports Beverages, Energy Drinks, and Non-dairy Milks) - U.S. Industry Analysis, Size, Share, Growth, Trends, and Forecast 2016 - 2024”.